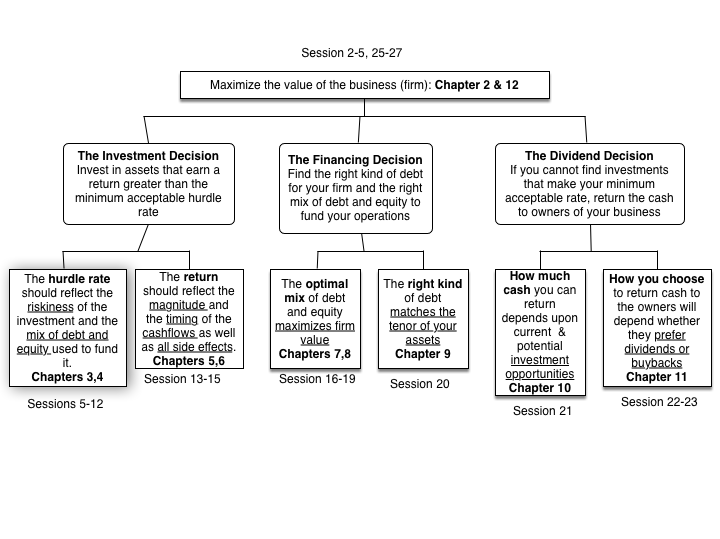 Corporate Finance 101: A Big Picture, Applied Class! In my last seven posts, I played my version of Moneyball with company data from the end of 2015, looking at how companies invest their shareholders' money, how much they borrow and the determinants of how much cash they return to stockholders. That structure is the one that underlies the corporate finance class that I have taught every year since 1984, the first two years at UC Berkeley, and the last 30 years at the Stern School of Business. Each semester, for the last few years, I have also invited you, even if you are not a Stern MBA student, to follow the class online, if you so desire, in all its gory details. 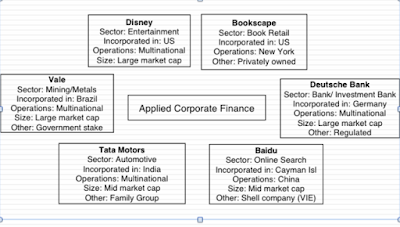 If you are considering this options, I thought it would make sense to take you on a mini-tour of corporate finance, as a discipline, and how I aim to tackle it in this class. All of corporate finance boils down to three broad decisions, the investment decision, which looks at where you should invest your resources, the financing decision, where you decide the right mix and type of debt to use in funding your business and the dividend decision, where you determine how much to hold back in the business (as cash or for reinvestment) and how much to return to the owners of the business. 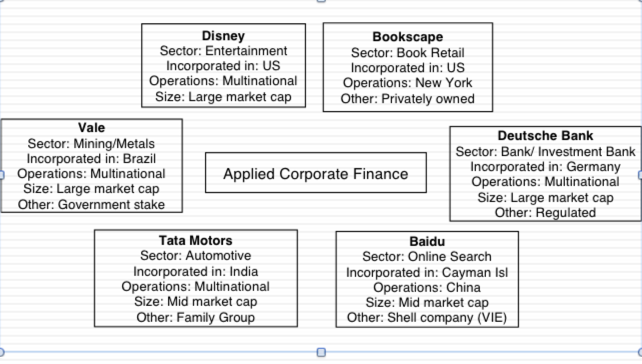 Thus everything I do in the class, from estimating hurdle rates to determining finance mix to assessing dividend policy, I try on Disney (a large, US, entertainment firm), Vale (a global mining company, based in Brazil, with a government interest in it), Tata Motors (an India-based auto company, part of a family group), Baidu (a Chinese search engine company, traded as a shell company on the NASDAQ), Deutsche Bank (a messy, money center bank, with regulatory constraints) and a small privately owned bookstore in New York City (owned by a third-generation owner). The class starts on February 1, with a session from 10.30 to 11.50, and continues through May 9, with sessions every Monday and Wednesday, with a break week starting March 14. The lectures are supplemented with slides and my book on applied corporate finance, with the latter being completely optional, since you can live without it. The calendar for the class is at this link. There will be three 30-minute quizzes in the class, each worth 10%, spread out almost evenly across the first 22 sessions, and each quiz will be non-cumulative, covering only the 6-7 sessions prior. In keeping with my view that this is not about memorizing equations and formulas, the quizzes will be open books and open notes. There is a two-hour final exam, which is cumulative and will be after the final session in May that will account for 30% of the grade. There will be two projects, with the first being an investment case (that I have not written yet) that will make you decide on whether to make a big investment or not (Apple in the electric car market, Google buying Twitter etc.) and the second being a semester-long exercise of trying every aspect of corporate finance on a company of your choice. My website: The links to the webcasts, as well as links to my other material (lecture notes, handouts, even emails to the class) can be found at this link. iTunes U: If you prefer a more polished format, I will also be putting the class online on iTunes U, the app that you can download from the Apple store for any Apple device. The link to the class is here and if already have Apple iTunes U installed on your device, you can add this class with the enroll code of EPF-JFH-SHE. YouTube Playlist: I will also be putting the classes up on a playlist on my YouTube account. With each session that I put up, I will also add links to the lecture notes used in the session and additional exercise. Not only can you watch the lectures and review the notes, you can also try your hand at the quizzes and final exam, when they are given. I will post the exams, after the class has taken them, online and I will post the solution, with the grading template that I used in class. You will be your own grader and may be tempted to go easy on yourself, but that's your choice. You can even do the case and the project, but I will unfortunately not have the resources to review or grade either. The good news is that none of this should dent your pocket book, but the bad news is that you will not get class credit or a certificate. Stretch it out: The class will stay online on all three forums for at least a year or two. Thus, you can stretch out the class to match your time schedule, instead of taking it in calendar time. I had at least three or four people completing the Spring 2012 class, last year. Online Corporate Finance class: If you find the 80-minute class sessions that make up this class unendurable, I do have a compressed version of the class, where I take each session and do it in 10-15 minutes, instead of 80 minutes. In a testimonial to how much we bulk up college classes, it was not that tough to do and you can find it on my website at this link, on iTunes U at this one or on YouTube at this one. Executive Corporate Finance class: I just completed a three-day corporate finance class for executive MBAs that is only a mildly compressed version of my regular class and you can find the links to the webcasts for that class on my website. I know that some of you may wonder what the catch is and where I plan to hit you up for fees. While you search for my hidden agenda, I have only one request of you. If you find any of the material in these classes to be useful to you, rather than thank me for it, please pass the favor on, by helping someone else learn, understand or do something. Not only will you get far more out of this simple act of kindness than the person that you offer it to, but I hope that you will also get a sense of why teaching is its own reward. In the last six posts, I have tried to look at the global corporate landscape, starting with how the market is pricing risk in the US and globally, how much investors are getting as risk free returns in different currencies and then moving on to differences across companies on the costs of raising funding (it varies by sector and region), the quality of their investments (not that good) and their indebtedness (high in pockets). 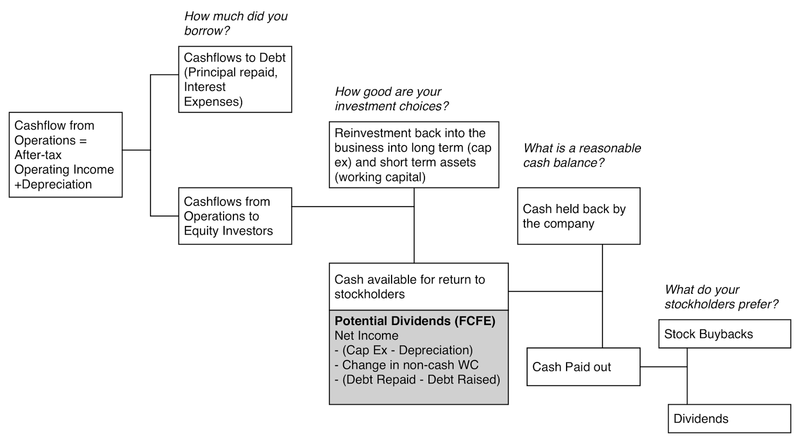 In this, the last of these posts, I propose to look at the final piece of the corporate finance picture, which is how much companies around the world returned to stockholders in dividends (and stock buybacks) and by extension, how much cash they chose to hold on for future investments. If you accept the logic of this process, companies that have substantial cash from operations, access to debt and few investment opportunities should return more cash than companies without these characteristics. In practice, the sequencing is neither this clean, nor logical. Dividend policy, more than any other aspect of corporate finance, is governed by inertia (an unwillingness to let go of past policy) and me-too-ism (a desire to be like everyone else in the sector) and as a consequence, it lends itself to dysfunctional behavior. 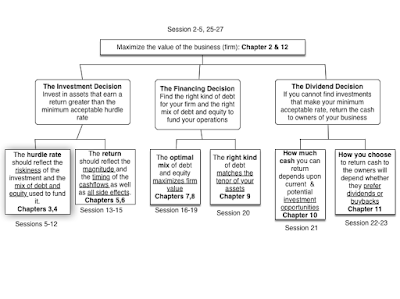 In the first dysfunctional variant, rather than be the final choice in the business sequence, dividends become the first and the dominant part driving a business, with the decision on how much to pay in dividends or buy back in stock made first, and investment and financing decisions tailored to deliver those dividends. Not surprisingly, dividends then act as a drain on firm value, since companies will borrow too much and/or invest too little to maintain them. In a diametrically opposite variant, managers act as if they own the companies they run, are reluctant to let go of cash and return as little as they can to stockholders, while building corporate empires. These companies can afford to pay large dividends, choose not to do so and end up, not surprisingly, with huge cash balances. It is worth noting that the corporate life cycle, a structure that I have used repeatedly in my posts, provides some perspective on how dividend policy should vary across companies. 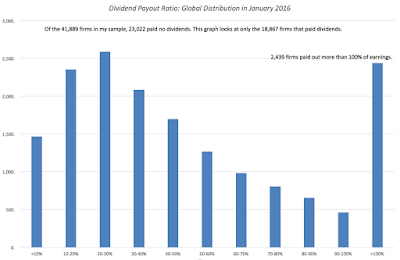 As with my other posts on the data, I started by looking at the dividends paid by the 41,889 companies in my sample, with an intent of getting a measure of what constitutes high or low dividends. So, here were go.. 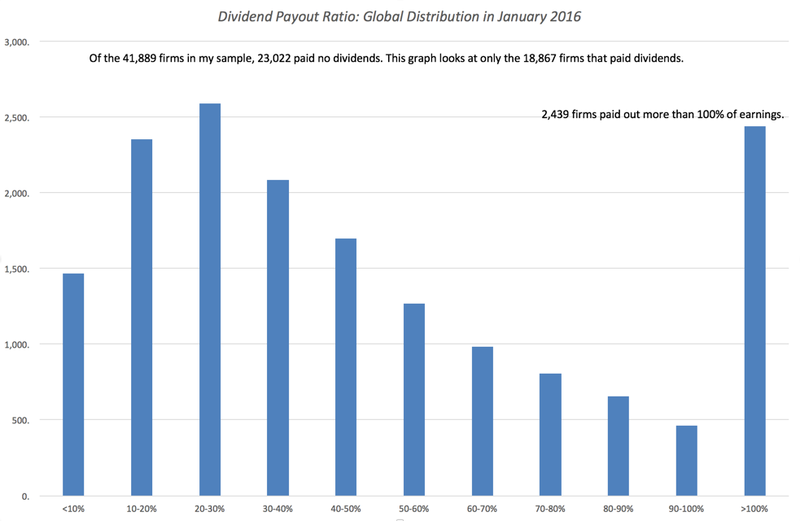 Note that more firms (23,022) did not pay dividends, than did (18,867), in 2015. Among those companies that paid dividends, the median payout ratio is between 30% and 40%. 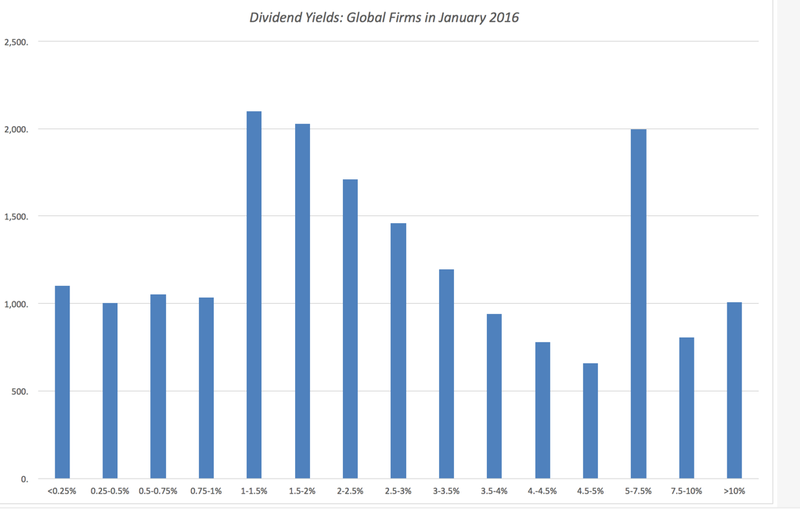 As with the payout, the yield is more likely to be zero than a positive number for a globally listed company, but the median dividend yield for a stock was between 2% and 3% in 2015. While it is true that US companies have been in the forefront of the buyback boom, note that the EU and Japan are not far behind. Buybacks are not only here to stay, but are becoming a global phenomenon. 3. 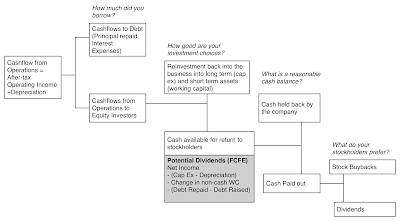 The Cash Balance Effect: Any discussion of dividends is also, by extension, a discussion of cash balances, since the latter are the residue of dividend policy. 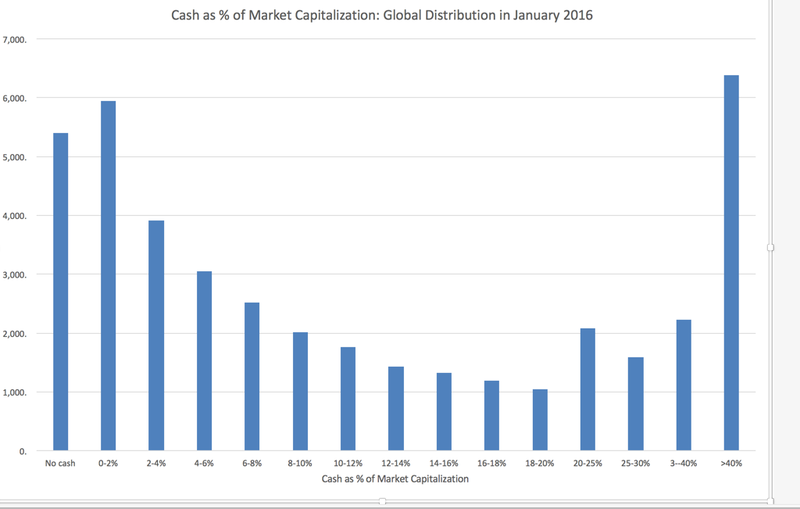 In this final graph, I look at cash balances at companies, as a percent of the market capitalizations of these companies. You may be a little puzzled about the companies that have cash balances that exceed the market capitalizations, but it can be explained by the presence of debt. Thus, if your market capitalization is $100 million and you have $150 million in debt outstanding, you could hold $150 million of that value in cash, leaving you with cash at 150% of market capitalization. If a key driver of dividend policy is a desire to look like your peer group, it is useful to at least get a measure of how dividend policy varies across industries. 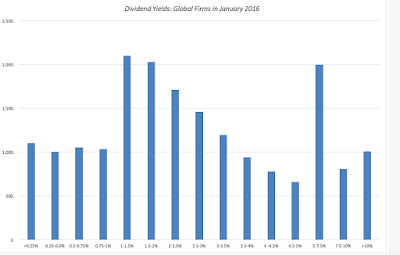 Using my 95 industry groups as the classification basis, I looked at dividend yields and payout ratios, as well as the proportion of cash returned in buybacks and cash balances, and you can download the data here. While there are many measures on which you can rank industries on dividend policy, I decided to do the rankings based on the cash balances, as a percent of market capitalization, because it is the end result of a lifetime of dividend policy. In the table below, I list the 15 industries that have the lowest cash balances, as a percent of market capitalization, in January 2016. While this is a diverse listing, most of these industries are in mature businesses, where there is little point to holding cash and one reason for the low cash balances is that many of the companies in these sectors return more cash than they have net income. At the other end of the spectrum are industries, where cash accumulation is the name of the game. Below, I list the 15 industries (not including financial services, where cash has a different meaning and a reason for being) that had the highest cash balances as a percent of market capitalization. In a few of these businesses, such as engineering and real estate development, the cash balances may reflect operating models, where the cash will be used to develop properties or on large projects and is thus transitional. There are other businesses, such as auto, shipbuilding and mining, where managers may be using cyclicality (economic or commodity) as a rationale for the cash accumulation. The ratio may also be skewed upwards in highly levered companies, since market capitalization is a smaller percent of overall value in these companies. Companies in Australia, Canada and the UK returned more cash collectively, in dividends, than they generated in net income, a reflection of both tax laws that favor dividends and a bad year for commodities (at least for the first two). 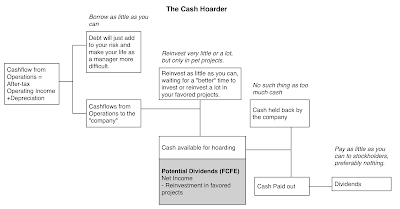 Japanese companies are cash hoarders, paying the least in dividends and holding on to the most cash. Indian companies are cash poor on every dimension, paying little in dividends and having the least cash, as a percent of market capitalization, of any of the regional groupings. 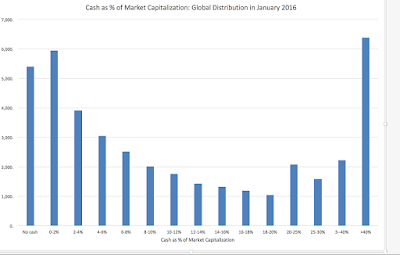 Finally, while much has been made about how much cash has been accumulated at US companies (about $2 trillion), the cash balance, as a percent of market capitalization, is among the lowest in the world. Absolute values are deceptive, since they will skew you towards the largest markets. Note that in some of these countries, the sample sizes are small and the statistics have to be taken with a lot of salt. For both managers and investors, dividends are more than just a return of cash for which companies have no use. Dividends become a divining rod for the company's health, a number that companies stick with through good times and bad and one that has its roots in imitation more than fundamentals. Consequently, companies often get trapped in dividend policies that don't suit them, either paying too much and covering up the deficit with debt and investment cut backs or paying too little and accumulating mountains of cash. 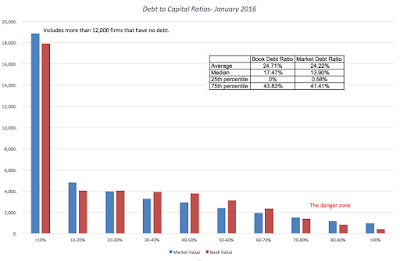 January 2016 Data Update 6: Debt, the double edged sword! In corporate finance, the decision on whether to borrow money, and if so, how much has divided both practitioners and theorists for as long as the question has been debated. Corporate finance, as a discipline, had its beginnings in Merton Miller and Franco Modigliani's classic paper on the irrelevance of capital structure. Since then, theorists have finessed the model, added real life concerns and come to the unsurprising conclusion that there is no one optimal solution that holds across companies. 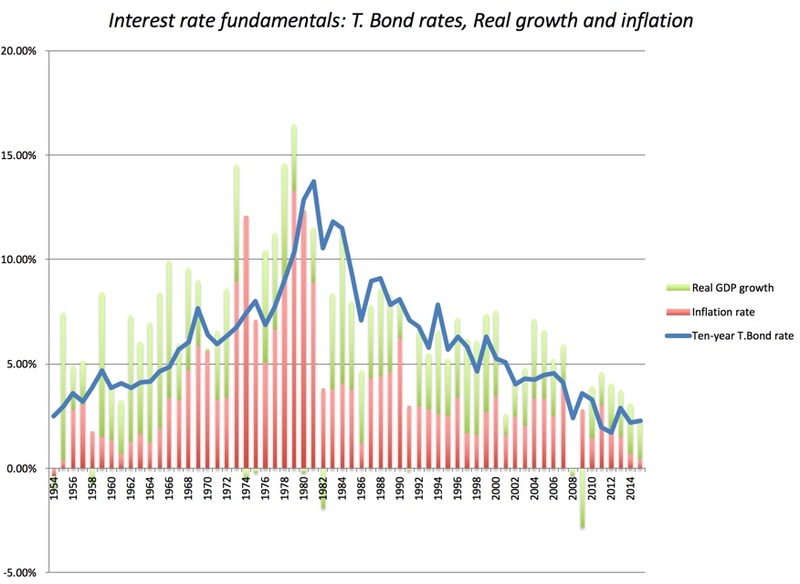 At the same time, practitioners have also diverged, with the more conservative ones (managers and investors) arguing that debt brings more pain than gain and that you should therefore borrow as little as possible, and the most aggressive players positing that you cannot borrow too much. The benefits of debt, for better or worse, are embedded in the tax code, which in much of the world favors borrowers. Specifically, a company that borrows money is allowed to deduct interest expenses before paying taxes, whereas one that is equity funded has to pay dividends out of after-tax earnings. This, of course, makes it hypocritical of politicians to lecture any one on too much debt, but then again, hypocrisy is par for the course in politics. 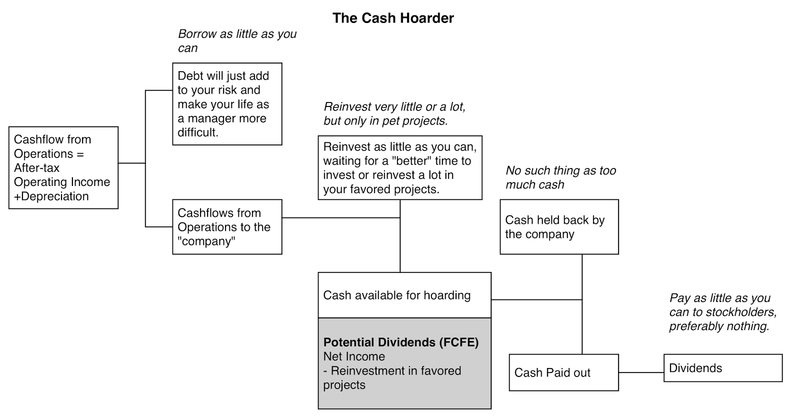 A secondary benefit of debt is that it can make managers in mature, cash-rich companies a little more disciplined in their project choices, since taking bad projects, when you have debt, creates more pain (for the managers) than taking that same projects, when you are an all equity funded company. On the other side of the ledger, debt does come with costs. The first and most obvious one is that it increases the chance of default, as failure to make debt payments can lead to financial distress and bankruptcy. The other is that borrowing money does create the potential for conflict between stockholders (who seek upside) and lenders (who want to avoid downside), which leads to the latter trying to protect themselves by writing in covenants and/or charging higher interest rates. 1. 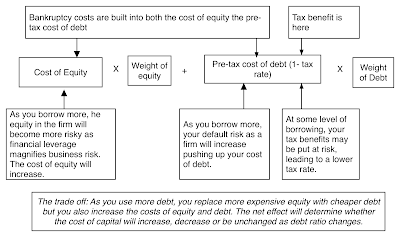 Tax Benefit: Interest expenses on debt are tax deductible but cash flows to equity are generally not. The implication is that the higher the marginal tax rate, the greater the benefits of debt. 1. Expected Bankruptcy Cost: The expected cost of going bankrupt is a product of the probability of going bankrupt and the cost of going bankrupt. The latter includes both direct and indirect costs. The probability of going bankrupt will be higher in businesses with more volatile earnings and the cost of bankruptcy will also vary across businesses. 2. Added Discipline: Borrowing money may force managers to think about the consequences of the investment decisions a little more carefully and reduce bad investments. The greater the separation between managers and stockholders, the greater the benefits of using debt. 2. Agency Costs: Actions that benefit equity investors may hurt lenders. The greater the potential for this conflict of interest, the greater the cost borne by the borrower (as higher interest rates or more covenants). Businesses where lenders can monitor/control how their money is being used can borrow more than businesses where this is difficult to do. In the Miller-Modigliani world, which is one without taxes, bankruptcies or agency problems (managers do what's best for stockholders and equity investors are honest with lenders), debt has no costs and benefits, and is thus irrelevant. In the world that I live in, and I think you do too, where taxes not only exist but often drive big decisions, default is a clear and ever-present danger and conflicts of interests (between managers and stockholders, stockholders and lenders) abound, some companies borrow too much and some borrow too little. By itself, there is little that you can read into this graph, other than the fact that there are some companies that are in danger, with earnings and cash flows stretched to make debt payments, but that is a conclusion you would make in any year. To dig a little deeper into where the biggest clusters of companies over burdened with debt are, I broke companies down by industry and computed debt ratios (debt to capital and debt to EBITDA) by sector. You can download the entire industry data set by clicking here, but here are the 15 sectors with the most debt (not counting financial service firms), in January 2016. There is a preponderance of real estate businesses on this list, reflecting the history of highly levered games played in that sector. There are quite a few heavy investment businesses, including steel, autos, construction shipbuilding, on this list. Surprisingly, there are only two commodity groups (oil and coal) on this section, oil/gas distribution, but it is likely that as 2016 rolls on, there will be more commodity sectors show up, as earnings lag commodity price drops. In contrast, the following are the most lightly levered sectors as of January 2016. The debt trade off that I described in the first section provides some insight into why companies in these sectors borrow less. Notice that the technology-related sectors dominate this list, reflecting the higher uncertainty they face about future earnings. There are a few surprises, including shoes, household products and perhaps even pharmaceutical companies, but at least with drug companies, I would not be surprised to see debt ratios push up in the future, as they face a changed landscape. 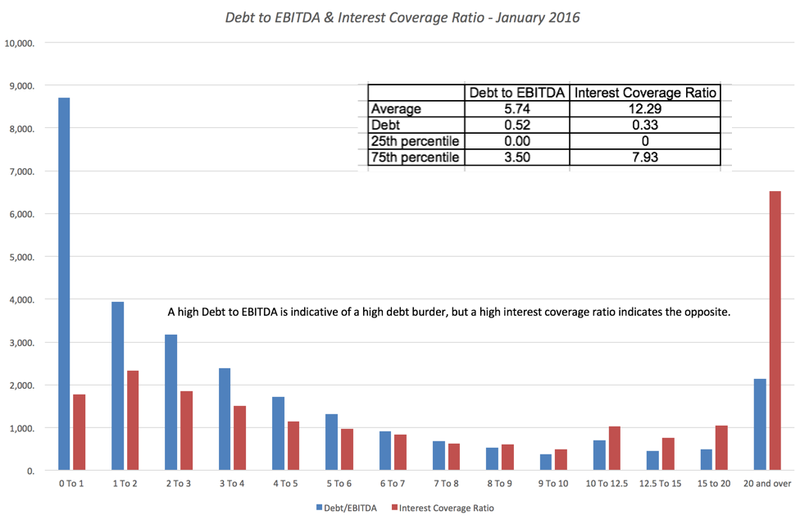 The measure that is most closely tied to the debt burden is the Debt to EBITDA number and that is what I will focus on in my comparisons. Not surprisingly, Australia, a country with a disproportionately large number of natural resource companies, tops the list and it is followed closely by the EU and the UK. Canada has the highest percentage of money-losing companies in the world, again due to its natural resource exposure. The companies listed in Eastern Europe and Russia have the least debt, though that may be due as much to the inability to access debt markets as it is to uncertainty about the future. With Chinese companies, there is a stark divide between mainland Chinese companies that borrow almost 2.5 times more than their Hong Kong counterparts. If you are interested in debt ratios in individual countries, you can see my global heat map below or download the datasets with the numbers. If the biggest reason for companies sliding into trouble in 2015 were China and Commodities, the first three weeks of 2016 have clearly made the dangers ever more present. As oil prices continue to drop, with no bottom in sight, and the bad news on the Chinese economy continue to come out in dribs and drabs, the regions and sectors most exposed to these risks will continue to see defaults and bankruptcies. These, in turn, will create ripples that initially affect the banks that have lent money to these companies but will also continue to push up default spreads (and costs of debt) for all firms. Debt is a double edged sword, where as you, as the borrower, wield one edge against the tax code and slice your taxes, the other edge, just as sharp, is turned against you and can hurt you, in the event of a downturn. In good times, companies that borrow reap the benefits of debt, slashing taxes paid and getting rewarded with high values by investors, who are just as caught up in the mood of the moment. In bad times, which inevitably follow, that debt turns against companies, pushing them into financial distress and perhaps putting an end to their existence as ongoing businesses. One constraint that I will bring into my own investments decisions in 2016 is a greater awareness of financial leverage, where in addition to valuing businesses as going concerns, I will also look at how much debt they owe. I will not reflexively avoid companies that have borrowed substantial amounts, but I will have to realistically assess how much this debt exposes them to failure risk, before I pull the "buy" trigger. In my last post, I looked at the cost of capital, a measure of what it costs firms to raise capital. That capital, if put to good use by businesses, should earn returns higher than the costs to generate value. Simply put, the end game in business is not just to make money but to make enough to cover a risk-adjusted required return. In publicly traded companies, it is managers at these companies, for the most part, who are investing the capital that comes from stockholders and bondholders (or banks), and corporate governance is a measure of whether these managers are being held accountable for their investment decisions. The second measure of profitability, and perhaps the more useful one in the context of measuring the quality of an investment, is obtained by scaling the operating earnings to the capital invested in a project or assets to estimate a return on invested capital. 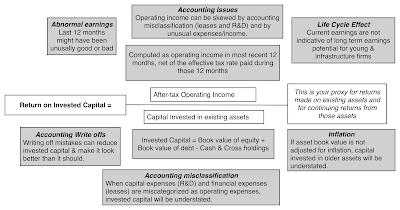 The capital invested is usually computed by aggregating the book values of debt and equity in a business and netting out the cash. 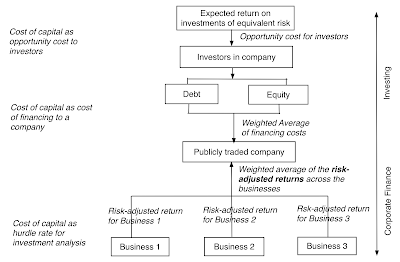 The resulting return on invested capital can be compared to the cost of capital to arrive at the excess return (positive or negative) earned by a firm. In the figure below, I look at the mechanics of the return on capital computation in the picture below. 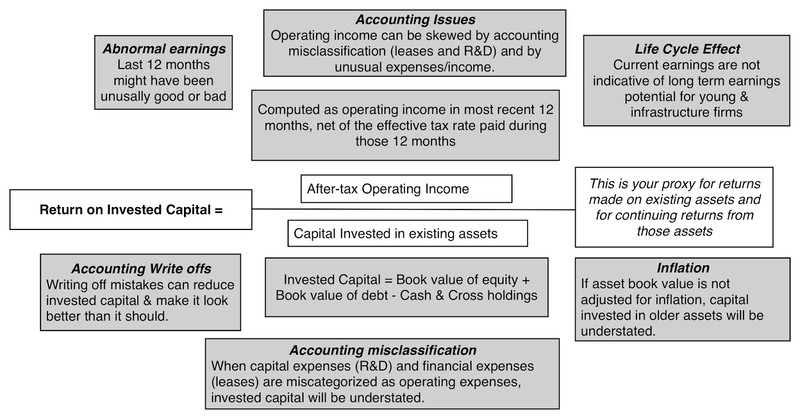 Note the caveats that I have added to the picture, listing the perils of trusting two accounting numbers: operating income and invested capital. I did try to correct for the accounting misclassifications, converting leases into debt and R&D into capital assets, and also computed an alternate return on capital measure, based on average earnings over the last ten years. Notwithstanding these adjustments, I am still exposed to a multitude of accounting problems and I have to hope and pray that the law of large numbers will bail me out on those. 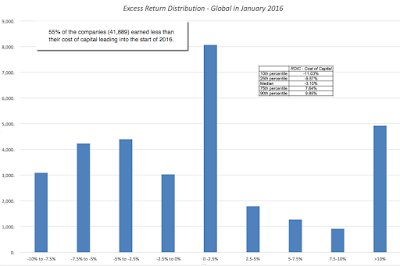 Overall, more than half of all publicly traded firms, listed globally, earned returns on capital that were lower than the cost of capital in 2015 and this conclusion is not sensitive to using average income or my adjustments for R&D and leases. The return on capital is a flawed measure and I have written about the adjustments that are often needed to it. That said, with the corrections for leases and R&D, it remains the measure that works best across businesses in capturing the quality of investments. In the second part of the analysis, I broke down the 41,889 companies into 95 industry grouping and computed the excess returns for each industry group. The full results are at this link, but I ranked companies based on the magnitude of the excess returns. Again, with all the reservations that you can bring into this measure of investment quality, the businesses that delivered the highest spreads (over and above the cost of capital) are listed below. The best-performing sector is tobacco, where companies collectively earned a return on capital almost 22% higher than the cost of capital. One potential problem is that many of the businesses on this list also happen to be asset-light, at least in the accounting sense of the word, and some of these returns may just reflect our failure to fully capitalize assets in these businesses. 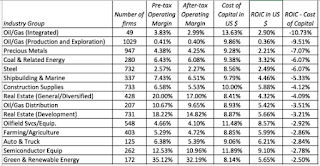 Looking at the other end of the spectrum, the following is a list of the worst performing businesses in 2015, based on returns generated relative to the cost of capital. Note that oil companies are heavily represented on this list, not surprising given the drop in oil prices during the year. That, of course, does not make them bad businesses since a turning of the commodity price cycle will make the returns pop. There are other businesses that have been affected by either the slowing down of the China growth engine, such as steel and shipbuilding, and the question is whether they can bounce back if Chinese growth stays low. Finally, there are some perennially bad businesses, with auto and truck being one that has managed to stay on this list every year for the last decade, grist for my post on bad businesses and why companies stay in them. In computing this excess return, I deliberately removed financial service firms from the mix, because computing operating income or invested capital is a difficult, if not impossible task, at these firms. 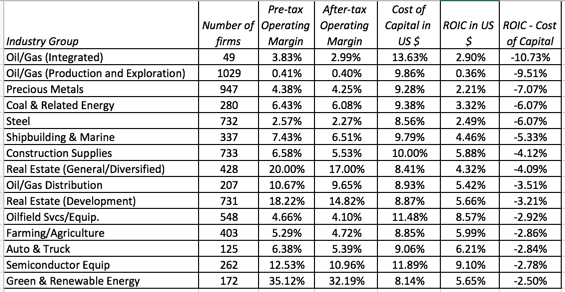 Lest you feel that I am giving managers at these firms a pass on the excess return question, I would replace the excess return spread (ROIC - Cost of capital) with an equity excess return spread (ROE - Cost of Equity) for these companies. Are firms in some parts of the world better at putting capital to work than others? To answer that question, I broke my global sample into sub-regions and computed both operating margins and excess returns (return on invested capital, netted out against cost of capital) in each one. 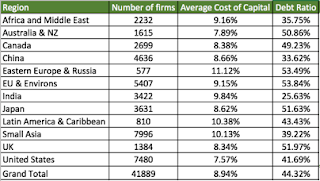 Looking at the list, the part of the world where companies seem to have the most trouble delivering their cost of capital is Asia, with Chinese companies being the worst culprits and India being the honorable exception. US and UK companies do better at delivering returns that beat their hurdle rates than European companies. Again, I would be cautious about reading too much into the differences across regions, since they may be just as indicative of accounting differences, as they are of return quality. It is also possible that some of the regions might have a tilt towards industries that under performed during the year and their returns will reflect that. Thus, the excess returns in Australia and Canada, which have a disproportionate share of natural resource companies, may be reflecting the drubbing that these companies took in 2015. I have been doing this analysis of excess returns globally, each year for the last few, and my bottom line conclusions have stayed unchanged. The value of growth: If the value of growth comes from making investments that earn more than your hurdle rate, growth in a typical publicly traded company is more likely to destroy value than to increase value (since more than 50% of companies earn less than their cost of capital). For investors and management teams in companies, I would view this as a signal to not rush headlong into the pursuit of growth. Bad management stays bad: In my sample, there are firms that have been earning excess returns year after year for most of the last decade, casting as a lie any argument that managers at these firms might make about "passing phases" and "bad years" affecting the numbers. To the question of why these managers continue to stay on, the answer is that in many parts of the world, it is almost impossible to dislodge these managers or even change how they behave. Bad businesses: There are entire businesses that have crossed the threshold from neutral to bad businesses, but management seems to be in denial. These are the businesses that I have described in my corporate life cycle posts as the "walking dead" companies and I have explored why they soldier on, often investing more into these investing black holes. Is good corporate governance the answer to these problems? In much of the world, the notion that stockholders are part owners of a company is laughable, as corporations continue to be run as if they were private businesses or family fiefdoms, and politics and connections, not stockholder interests, drive business decisions in others.. Even in countries like the United States, where there is talk of good corporate governance, it has become, for the most part, check-list corporate governance, where the strength of governance is measured by how many independent directors you have and not by how aggressively they confront managers who misallocate capital. Institutional investors have been craven in their response to managers, not just abdicating their responsibility to confront managers, where needed, but actively working on behalf of incumbent managers to fight off change. The sorry record of value creation at publicly traded companies around the globe should act as a clarion call for good corporate governance. In the words of Howard Beale, from Network, we (as stockholders) should be "mad as hell and should not take it any more". In this post, the fourth in my data update series, I turn my focus to the cost of capital. While the discussion of cost of capital is often obscured by debates about risk and return models, it is a number central to much of what we do in corporate finance and valuation, and it predates modern portfolio theory. You cannot run a business without a sense of what you need to make on your investments to break even and you cannot value a business without a measure of your opportunity cost. I teach two classes, corporate finance and valuation, and I wear different hats, when looking at the same questions. In corporate finance, my focus is on how to run a business, using fundamental financial principles, and in valuation, I shift my attention to how value that business, using the same principles. Like Waldo, the cost of capital is a constant part of both classes, playing a key role in almost every discussion. In the corporate finance class, it shows up in each of the three big questions that every business has to answer. It helps you answer the first one, on where you should direct your investments, by suppling your business with a hurdle rate or rates for investments, with riskier investments having to meet a higher threshold, to be acceptable. In capital structure, the cost of capital becomes an optimizing tool that helps you decide the right mix of debt and equity. In dividend policy, the cost of capital becomes the divining rod for whether you should be returning more or less cash to your stockholders. If you operate in a business where your returns on new investments consistently fall short of your cost of capital, you should be returning more cash to your investors. In the valuation class, the cost of capital is the discount rate that you use to bring operating cash flows back to today, to arrive at a value for a business. It has, unfortunately, also become the instrument that analysts use to bring their hopes, fears and worries into value, adding premiums to the discount rate, if an asset is illiquid, or reducing it, if it provides other benefits. In short, it is difficult to do financial analysis without at least getting a sense of what the cost of capital is, for a business. The many uses to which it is put has also meant that it has become all things to all people, a number that is misused, misestimated and misunderstood. 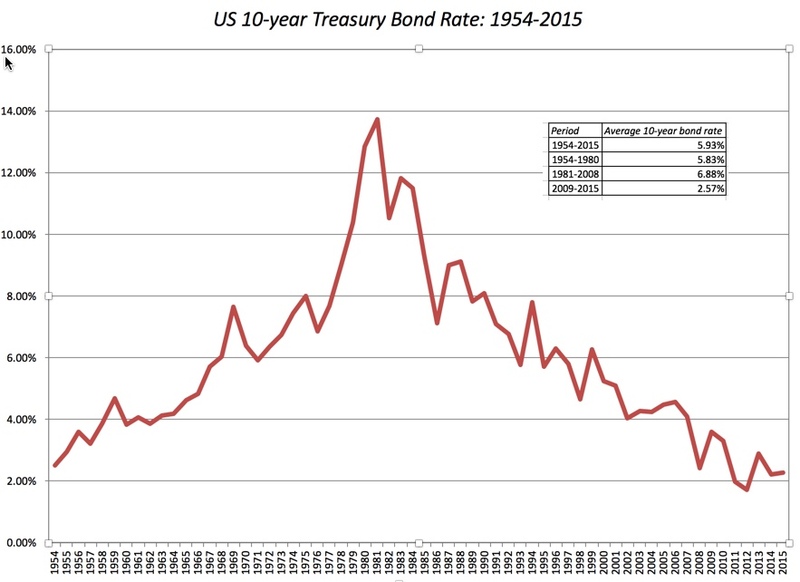 I used the US 10-year bond rate of 2.27%, on January 1, 2016, as my risk free rate. 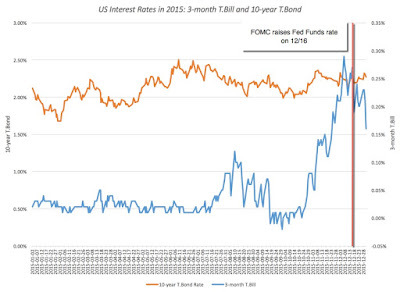 I don't like to play games normalizing risk free rates. 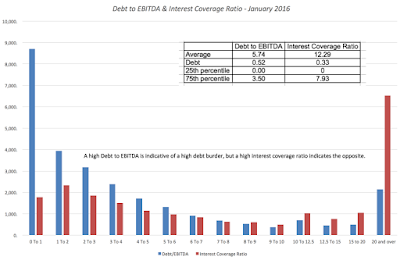 I used the average unlevered beta for the sector as the beta for the company and levered this beta with the current debt to equity ratio of the firm. I used the implied equity risk premium for the S&P 500 (6.12% on January 1, 2016, rounded down to 6%) as the equity risk premium for all US companies in estimating the cost of equity. I know that some US companies have operating risk exposure outside the US, but I see no easy way that I can compute regional-weighted ERPs for this many companies. 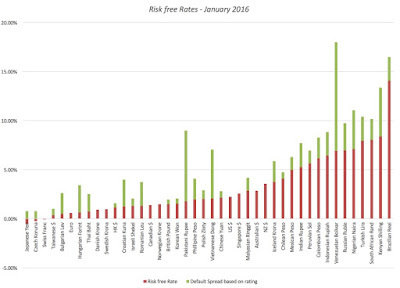 For the cost of debt, I used the S&P bond rating, if one was available, to estimate the default spreads and pre-tax cost of debt of the firm. 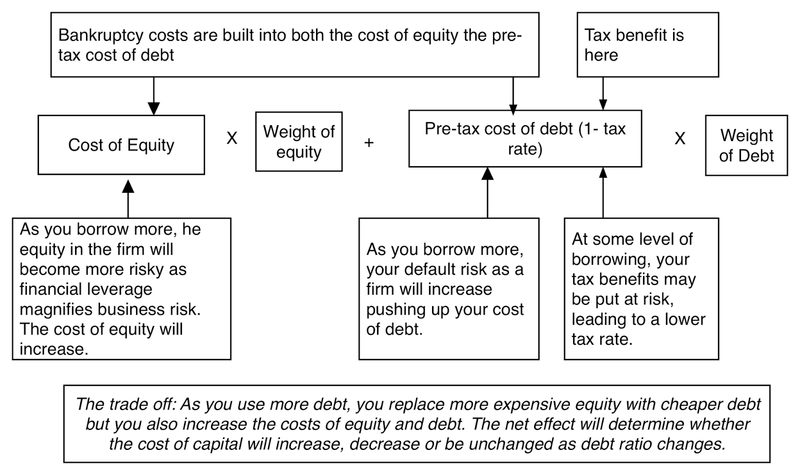 For non-rated company, I used the standard deviation in equity in conjunction with a look up table (see the cost of capital spreadsheet) to estimate the default spread and pre-tax cost of debt. I used 40% as the marginal tax rate for the US in estimating the after-tax cost of debt. 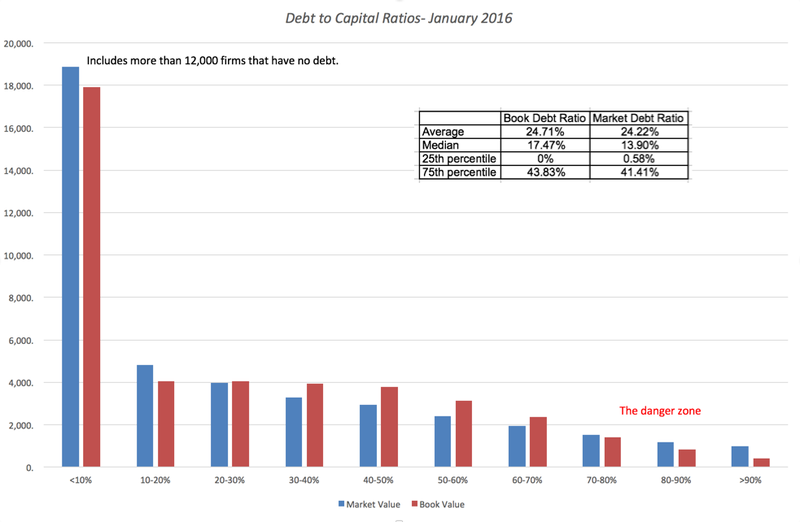 I used the current market capitalization as the value of equity and added up all interest bearing debt with the present value of lease commitments (for the next 5 years and beyond) to get to the debt, in computing the weights for debt and equity. 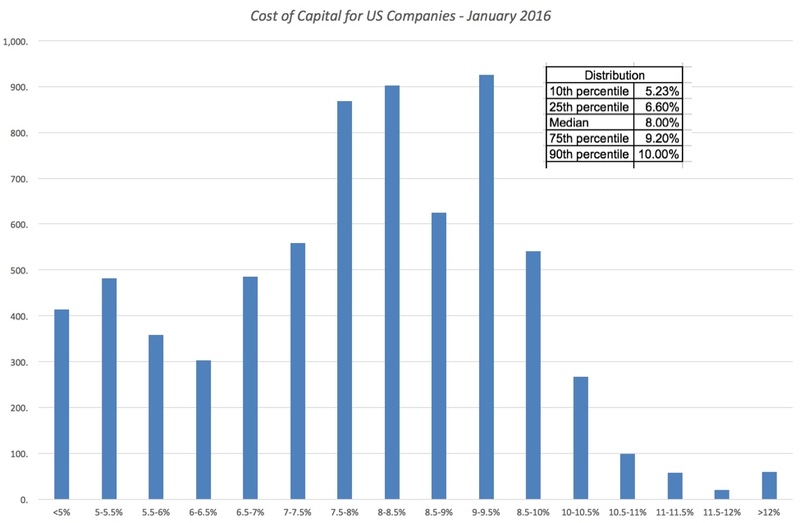 The resulting distribution of costs of capital across US companies is summarized below. 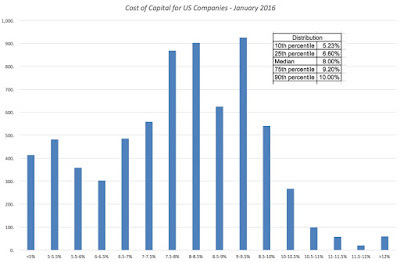 Note that 90% of US firms have costs of capital between 5.23% and 10% and 50% of US firms have costs of capital between 6.60% and 9.20%. 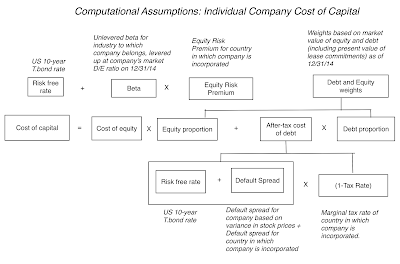 If you are skeptical about betas and don't like computing costs of equity based upon them, I have a suggestion. 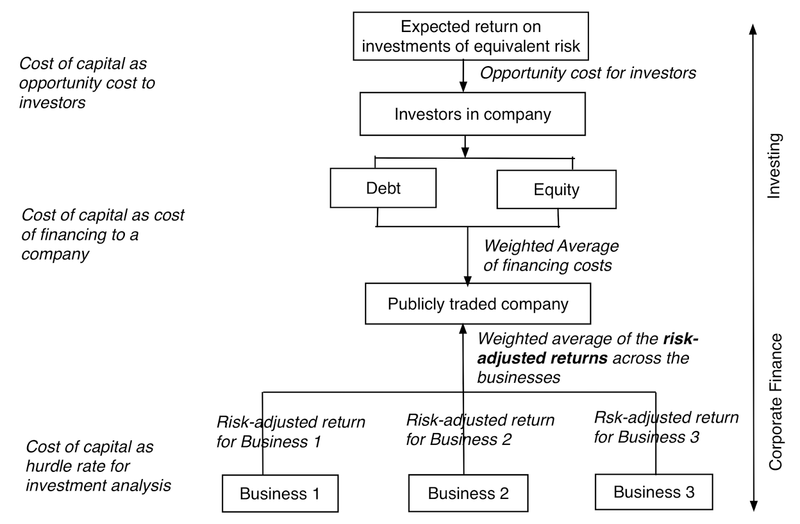 Use the distribution of costs of capital in this graph, as your basis, for estimating a cost of capital for your firm. Use the cost of capital at the 90th percentile as your cost of capital for a risky firm, 8% as your cost of capital for a mature firm and 5.23% as your cost of capital for a very safe firm, and you should be relatively safe. I also computed the cost of capital differences across global regions. 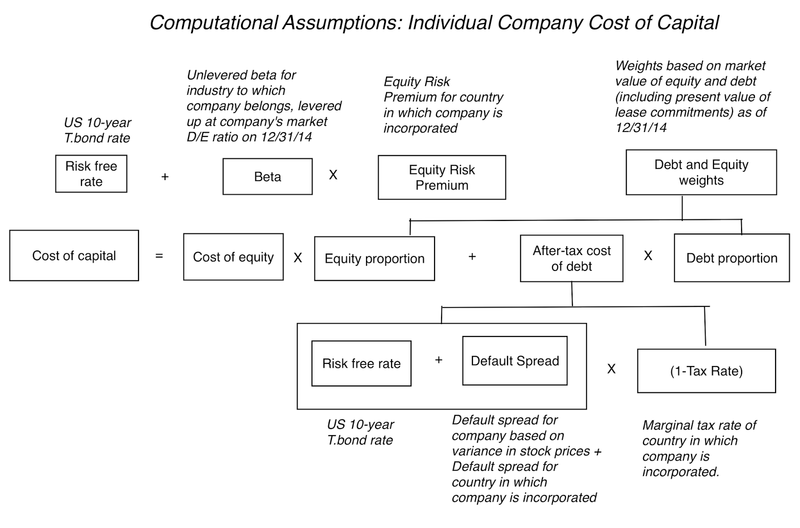 Note that the differences are not rooted in currency, since the cost of capital for every firm is computed in US dollars. As to why costs of capital vary across countries, the answer can be traced back to two factors. The first is that debt ratios vary across the world, and that this may explain some of the variation. 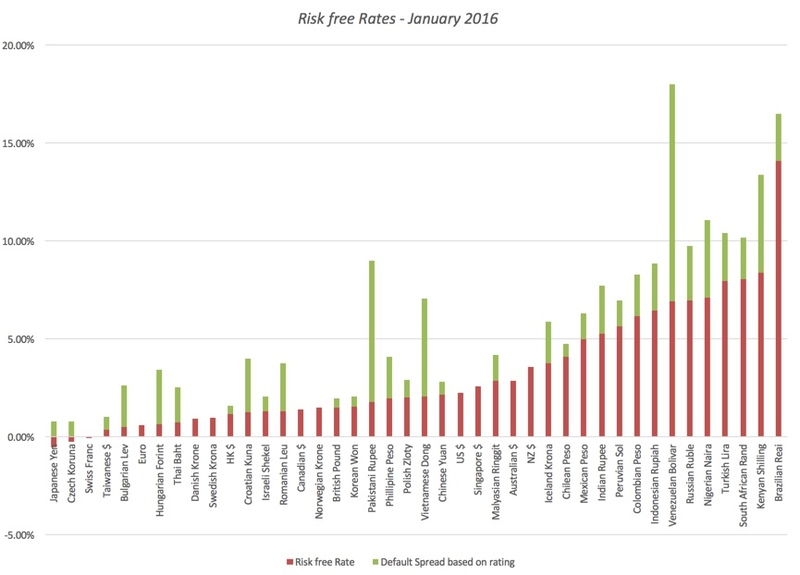 The second is that the regions of the world with higher sovereign default spreads and equity risk premiums (they go together in my approach) will have higher costs of capital than regions that have less risk. The table below summarizes the difference. US companies have the lowest costs of capital, on average, in the world and East European and Russian companies carry the highest costs of capital. These are all in US dollars, but you can use the differential inflation approach to convert them into other currencies. So, what now? If you have to estimate the cost of capital for a sector or a company in that sector, in US dollar terms, you could use the cost of capital for any companies that you value, in this sector. Again, adding the inflation differential will give you the cost of capital in any other currency. 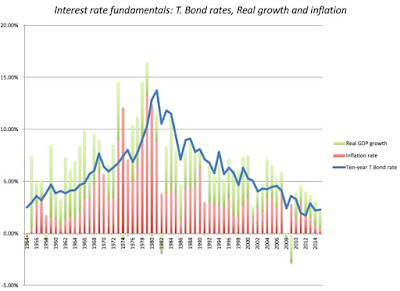 The cost of capital may be the most used number in finance, but it is also the most misused. Companies often use one cost of capital to assess investments with different risk profiles, acting on the presumption that the cost of capital is the cost of raising company, rather than a risk adjusted required return for investing in a risky asset. Investors use the cost of capital as a dumping ground for all their fears about investments, augmenting the standard risk-adjusted discount rate with premiums for liquidity, small market capitalization and opacity. We can do better! I had a long post on country risk in July 2015, as part of series of posts on the topic. At the time of the post, the Chinese market was in the midst of a meltdown, emerging markets were in turmoil and exchange rates were on the move. It is six months later, and nothing seems to have changed, but I think that the core lesson is worth reemphasizing. In a world of multinational businesses and global investors, there is no place to hide from country risk. As an example, let's assume that I want to estimate the equity risk premium for operating in India in January 2016. I start with the implied equity risk premium for the S&P in January 2016, which I estimated to be 6.12% in my first data post a few days ago. I use a rounded down estimate of 6% as my mature market premium for the start of 2016. As a second step, I look up the local currency sovereign rating for India from Moody's and arrive at a Baa3 rating; the typical default spread for a Baa3 rated country at the start of 2016 was 2.44%. I check this estimate against the sovereign CDS spread for India, which was 2.11% on January 1, 2016. 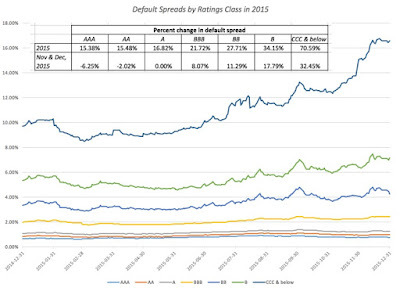 I use the ratings-based spread of 2.44% as the default spread for India, though I would not raise too much of a fight, if you insisted on using the CDS spread. 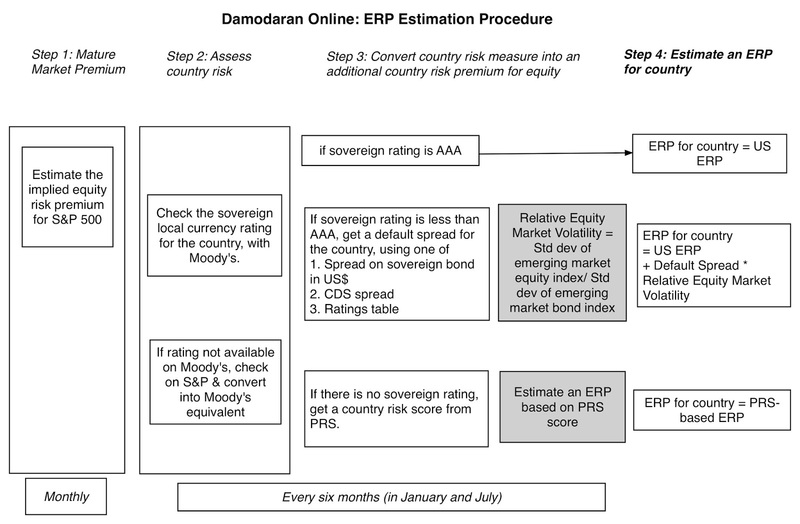 In the fourth step, I add the country risk premium to the implied premium of 6% that I estimated in step 1 to arrive at an equity risk premium for India of 9.28%. Is this number an estimate? Of course! Would you get a different number if you used the CDS spread as your measure of default risk and different indices for emerging market equities and bonds? The answer is yes. It is for this reason that the spreadsheet that I create for equity risk premiums allows you to replace my defaults with yours for any or all of these variables. Before you exhaust yourself in this effort, I would suggest that small differences in this number will not make or break your valuation. So, make your best estimates and move on! In my July 2016 updates, I also included one on how stocks are priced around the world, using multiples (PE, PBV, EV/Sales, EV/EBITDA, EV/Invested Capital). While that post has a more extensive explanation of why stocks should trade at different multiples around the world, I have updated the multiples, by country, in this spreadsheet. 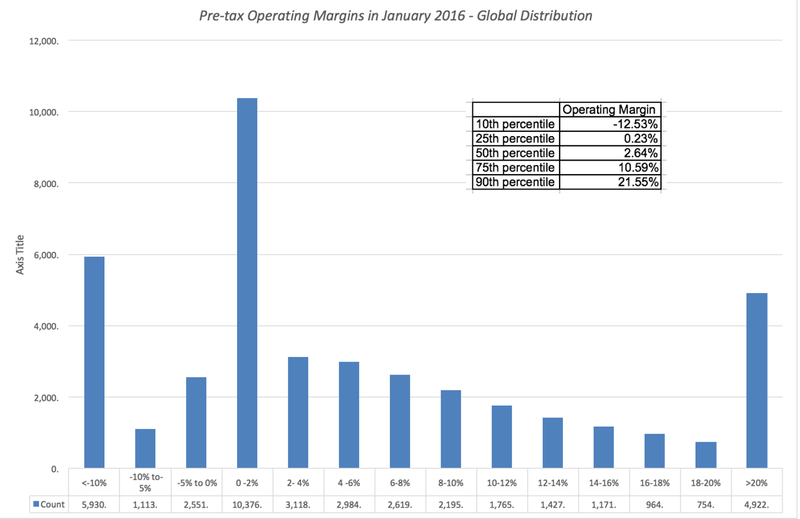 As you peruse these numbers, keep in mind that the number of companies that I have in data set is very small for some countries and the multiples can therefore yield strange values. To prevent outliers from hijacking my estimation, I also compute the multiple using aggregated values; thus, the PE ratio for China is computed by adding the market capitalizations of all companies listed in the market and dividing by the aggregated net income of these companies. Much as I would like to read more into this picture (especially about cheap and expensive markets), these country numbers are more a first step in the investment process than a last one. 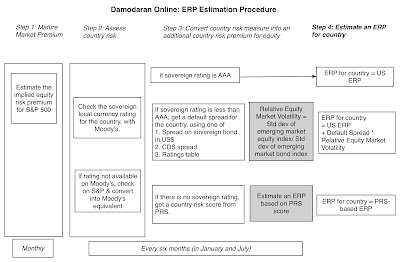 I think that we are far too casual in our treatment of country risk, estimating equity risk premiums on auto pilot for countries and attaching these premiums to companies based on where they are incorporated, rather than where they do business. If there is a lesson from the last week's implosion in the Chinese market, it is that the emerging market growth story that so many developed market companies have pushed for the last two decades has a dark side, and that dark side takes the form of higher risk. It is easy to forget this intuitive concept in the good times, but the market lulls us into complacency before shocking us. In both corporate finance and valuation, interest rates and exchange rates play a big role, the former because they form the basis for estimating required returns on risky investments, and the latter, since they affect your earnings and cash flows. That said, the biggest mistakes that we make in finance often come from trying to forecast one or both variables, implicitly or explicitly, when making corporate finance or investment decisions. The intrinsic ten-year bond rate, if you add the latest estimates for inflation (0.40%) and real GDP growth (2.1% annualized, through 3rd quarter), is 2.50%, close to the treasury bond rate of 2.27% on December 31, 2015. Unless one or the other of these variables changes significantly over the next year, I don't see rates moving back this year, with or without Fed action. 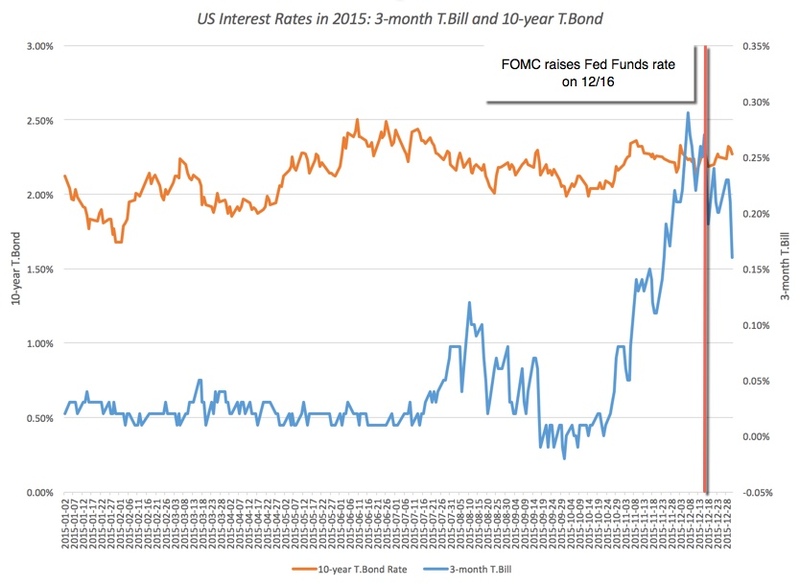 While there was little movement in US treasury rates during the course of the year, there was volatility in the corporate bond market, especially in the last few weeks of the year. Corporate default spreads (over the US T.Bond) increased across the board during the course of the year, unusual for a year where the US economy was showing signs of strength, but indicative of both the globalization of the US corporate bond market and the corrosive effects of the commodity price meltdown. 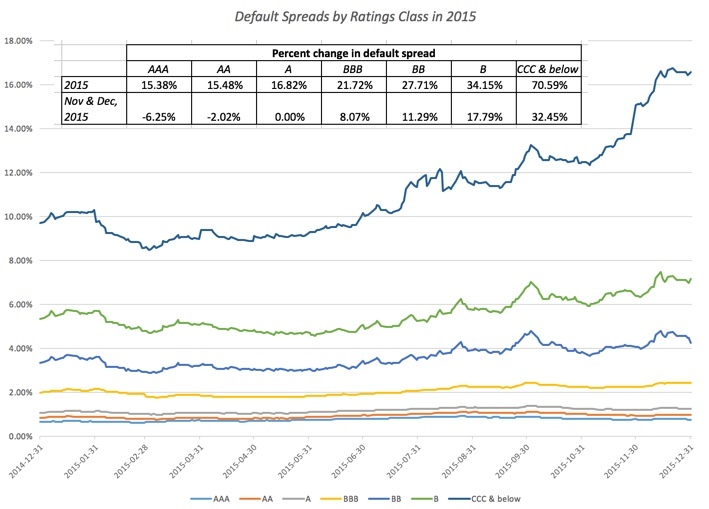 In November and December, the lowest rated bonds (CCC and below) saw default spreads widen dramatically, perhaps a precursor to the repricing of risk both in this and the equity markets. The world used to be a much simpler place before globalization. Most companies did business in the countries that they were incorporated in and raised their financing (debt and equity) in the local currency. If exchange rates were an issue, they had only a marginal impact on earnings and value and the effects were easily eliminated through hedging. Those days are in the past, as multinationals are now more the rule than the exception, not only spreading their operations around the world, but also raising funding in multiple currencies. In a post in July 2015, I looked at how corporate financial decisions and valuations are distorted by decision makers mixing and mismatching currencies. As China's markets melt down and threaten to take the rest of the world down with them, and exchange rates are in turmoil, I decided to revisit some of the basic rules of dealing with currencies, using my most recent data update to fill in the blanks. 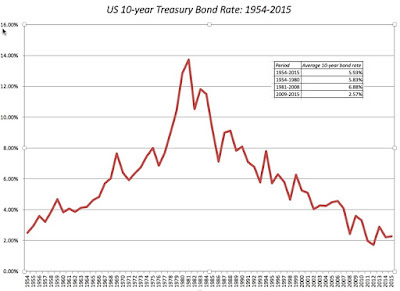 The weakest links in these estimates are not the default spreads, but the government bond rates, since many government bonds are illiquid and controlled. The key to dealing with currencies is to be consistent: In my post on currencies in July 2015, I argued that valuation/corporate financial decisions should be currency invariant; a company that looks expensive, if you value it in US dollars, should not magically become cheap, if you value it in Indian rupees. The reason is simple. If you value a company in Indian rupees instead of US dollars, you will be using a higher discount rate (since the risk free rate in Indian rupees is about 3% higher than the risk free rate in US dollars) but the effect will be offset by the growth rate being higher by 3% as well. For companies with operations and financing in many countries and currencies, you therefore have two choices. The first is to pick a single currency to value the company in and to convert all of the numbers into that currency before doing your valuation; you can value Nestle in Swiss francs, US dollars or Russian Rubles. The second is to value each currency stream separately, using that currency's inflation in both the cash flows and the discount rate, and to add the values of the different streams. That may sound more precise but it is not only a lot more work but may require information at the regional level on investment and cash flows that is not always available. Exchange rates are momentum driven, but fundamentals ultimately win out: Currencies are momentum driven, allowing traders to make money for extended periods on strategies that build on momentum. However, when momentum shifts in currency markets (either because of a market mood shift or a government intervention), the profits generated from years of momentum trading can be wiped out in a fraction of the period. In my valuations, when I have to forecast exchange rates (to convert cash flows in future periods from one currency to another), I adopt a very simple strategy, using the differential inflation rates between the currencies as my basis for expected currency appreciation or depreciation (purchasing power parity). Thus, if I were required to forecast the US dollar/Indian rupee exchange rate for the next decade in a valuation, I would build in an expected depreciation in the rupee of about 3% (the same inflation differential between the Indian rupee and the US dollar that I used in the risk free rate computation). Not only does it keep my valuations internally consistent but it comes with two bonuses. The first is that my inflation mistakes cancel out; thus, if the expected inflation in India turns out to be 6% higher than the US inflation rate, instead of 3%, both my cash flows and my discount rates will be understated and the effects will offset. The second is that I save myself the aggravation of having to listen to currency experts, whose expertise seems to lie not in forecasting in the future but in providing elaborate rationales for past forecasting errors. This has been the worst opening few days for equity markets in the United States in history, and the damage has been greater in many emerging markets. The US dollar is stronger, emerging market currencies are weaker and interest rates are on the move. The macroeconomic soothsayers will be out in full force, with predictions aplenty about where interest rates and exchange rates will be going this year. Much as you will tempted to alter your asset allocation mixes and investment strategies, based on their forecasts, my advice is that you chart your own course. I plan to take the karmic route for macro variables, accepting that change is the only constant and completely out of my control. While that strategy may do little to protect my portfolio, it does wonders for my psyche.